#11 Sunny top floor unit with beautiful city views to the north and partial Bay views to the north east. One bedroom with Queen size bed, living room sofa converts to a second full sized bed, hardwood floor in kitchen. Open plan kitchen has counter seating. Cable tv, second tv in bedroom, high speed internet included, washer and dryer in the unit, parking available. #10 Partial Bay Bridge views! This high floor sunny living room boasts many upgrades. Marble floors, designer furnishings with Queen sized bed. Cable tv, high speed internet access included, washer and dryer in the unit, parking available. #10a Sunny furnished one bedroom, one bath with Queen size. Carpet in main room, tile in kitchen and bath, dining table in living area, all electric kitchen with dishwasher. Cable tv, high speed internet access included, washer and dryer in the unit, parking available. #10b Sunny furnished studio with Queen size. Carpet in main room, tile in kitchen and bath, dining table in living area, all electric kitchen with dishwasher, garbage disposal. Included with rent are; cable tv, high speed internet, washer and dryer. Parking available. #3 Sunny stylish decorated one bedroom with Queen size bed overlooking east garden. Open plan kitchen with dining area. 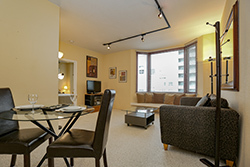 High speed internet access included, cable tv, washer and dryer in the unit, parking available.